Late last summer, my brother-in-law Brian passed away from long-term complications related to his 16 year battle with cancer. Brian is the reason I started riding the Pan Mass Challenge (PMC) and he will continue to be my motivation as I ride in his memory in the future. My PMC journey started the in the summer of 2001. Brian was in the hospital in Boston and I was on vacation with my wife and three children in Truro, Massachusetts. Truro is on Cape Cod about 5 miles before Provincetown. As we departed our vacation early on Sunday morning and drove up Route 6 heading towards Boston, we passed hundreds of Pan Mass Challenge riders as they cycled towards Provincetown to complete their two-day, 192 mile journey raising money to fight cancer. It was at that moment I vowed to ride the PMC the following year, and I have been doing it ever since 2002. This August, I will be riding in my 17th Pan Mass Challenge. Would you consider donating to my ride? Since I began my PMC journey I have raised more than $70,000 and this year I have committed to raising $4900. 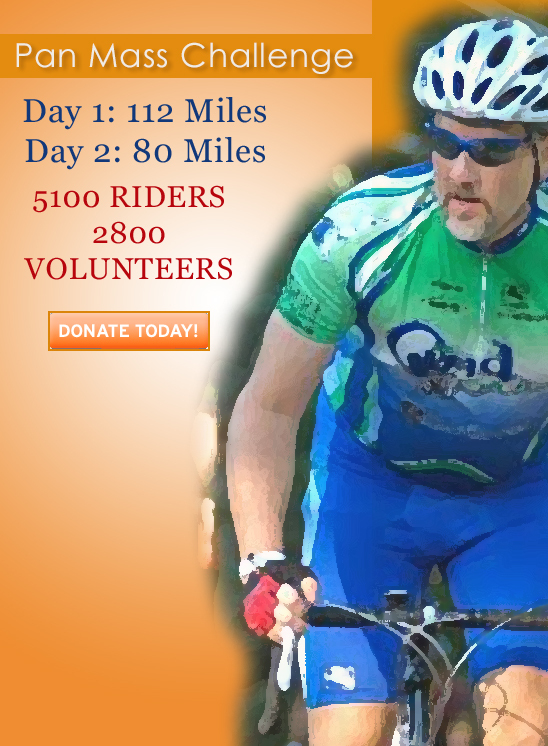 The PMC donates 100% of every rider-raised dollar directly to Dana-Farber Cancer Institute. Since its inception in 1980 the PMC has raised $598 million. Click Here to Donate. Since 2002, your donations have helped me raise than $70,100 for cancer research by riding the PMC. Every so often, I watch this video to remind myself of why I ride the PMC. It makes me think of my family, my friends and of you…and I realize I must work to cure cancer in the way I know best: by raising money to find a cure. This disease should not burden our children; we must find a way defeat it. You can contribute your money, your time, or both. If you don’t ride a bike, consider volunteering during PMC weekend. However, I must warn you, it might just change your life. It is a great event with thousands of volunteers and I dare say you might just be swept up in the emotion of the event for years to come. Visit www.pmc.org to learn more.